Three Stone Diamond Ring in vintage style. The Vintage Vanderbilt ring is inspired by Art Deco design, but is completely contemporary. Unisex, this piece makes a great alternative engagement ring. The center stone is 81 points with two 40 point side stones with 0.22 carats of melee diamonds bezel set into the ring. The ring was sculpted in 18k white gold, which was not rhodium plated, as most white gold is. This ring is unique in that it features 18k white gold in its original color as a design element. This ring was designed by top jewelry designer Douglas Elliott. Douglas Elliott created the ‘halo’ engagement ring based on Art Deco design. 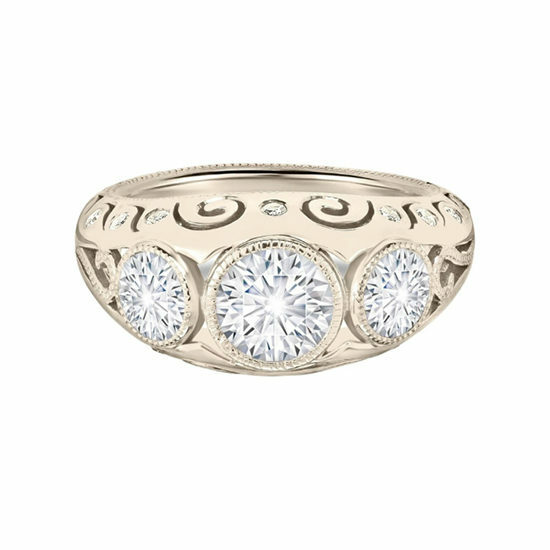 This ring is also inspired by Art Deco three stone rings.